FREDERICKSBURG, Texas — Brad and Sheryl Kott didn’t think much of it seven years ago when their 13-year-old son, Quinn, complained his arm felt tingly. But later that day, Mr. Kott found Quinn — a friendly, energetic athlete — on the bathroom floor. His speech was garbled. After the family arrived at Hill Country Memorial, the local hospital in Fredericksburg, the Kotts say Quinn’s medical care went terribly wrong. Quinn waited in a wheelchair in the emergency room for hours despite his drooping face and slurred speech, and his parents and former hospital administrators say, the ER doctor was inattentive, callous and at a point late in the evening, decided to send Quinn home. As Brad Kott brought his son out to his truck in the parking lot, his wife refused to take their son home. She rushed back into the ER and demanded to see the doctor. It wasn’t until the next morning that a pediatrician finally examined Quinn. He was rushed to a hospital in San Antonio, about 70 miles south, and died soon after. He had suffered a massive stroke. For Dr. Michael Williams, then Hill Country Memorial’s chief executive officer, Quinn Kott’s death in 2009 was a crucible moment. I met the doctor coming down the hall, and I said, ‘Something is wrong with Quinn.’ And he shushed me. Yet fixing the problems would not be easy because the troubled hospital in Fredericksburg was caught up in larger forces. Since 2010, more than 50 rural hospitals have closed across the country and hundreds more are in fragile financial condition. Rural populations have declined, and, in many places, those that remain are largely elderly or uninsured. At the same time, congressional budget agreements and the Affordable Care Act reduced Medicare reimbursement and subsidies for the uninsured. Many rural hospitals have been unable to withstand the revenue losses. The hospital in Fredericksburg, a town of about 10,000 deep in the heart of Texas Hill Country, could easily have faced a similar fate. Despite the area’s live music scene and strong tourist economy, the hospital was the town’s largest employer and cherished for much of its history. When it opened in 1971, 93 percent of the county’s households contributed money — including Quinn Kott’s grandparents — and old photographs show thousands of people lined up to have a first look. Years later, as the hospital faced the crisis of Quinn Kott’s death, Williams was determined to bring back that spirit. He studied the Toyota plant in San Antonio and hired former Toyota employee Jeff Darnaby to help bring the car company’s revered assembly line principles to Hill Country Memorial. Today at Hill Country Memorial, each department candidly displays specific goals for everyone to see: reduce ER wait times, eliminate falls and improve customer satisfaction. In addition to Toyota, Williams turned to a former executive with Southwest Airlines to remake the hospital’s values and culture, and he hired a former trainer from Ritz Carlton, known for its legendary customer service, to change how patients and families were treated. “We took the approach that if we took patients and we treated them better than they’d ever been treated before, that at the end of the day, they would drive the bottom line,” said Williams. They take such good care of you. It’s like doing business in a small-town bank. Seven years after Quinn’s death, Hill Country Memorial now ranks among the top 100 hospitals in the country and recently won the nation’s highest presidential honor for excellence through innovation and leadership. The sweeping changes can be seen everywhere: staff members, including physicians, greet visitors in the hallway and ask if they need directions; during a daily afternoon quiet time, the hallway lights darken so patients can rest; and the kitchen staff, in an attempt to reduce waste, cut their egg budget in half. Along with other cost saving measures, the hospital cut costs by $600,000. Emily Padula, the hospital’s chief strategy officer, says whatever the goal — reducing costs, growing market share, perfecting customer service — rural hospitals should not think they need a lot of money to improve. “We found that our costs are about the average for the country for a hospital, employee staffing is about average for the country, and yet our patient satisfaction is in the top 5 to 10 percent of the nation. So it’s not that you have to put in place all these fancy things to make a difference,” Padula said. In response to trends affecting hospitals across the country — fewer in-patient visits, declining Medicare reimbursement and Texas officials’ refusal to expand Medicaid — Hill Country Memorial employees stake out new lines of business in weekly meetings in the so-called War Room. Those efforts have led the hospital to diversify its offerings to include a breast health center with high-tech imaging, home hospice care and a wellness center. To capitalize on the abundance of Medicare-insured retirees in Texas Hill Country, the hospital developed a well-regarded hip and knee replacement program that has attracted patients like George Brannies, a fifth generation Texan from the nearby town of Mason. After a riding accident a few years ago, Brannies, 72, sought care from a renowned surgeon in San Antonio. When the hip surgery failed, the rancher and bank chairman decided to try Hill Country Memorial. His surgeon and nurses were so exceptional, Brannies said, that he was back on his horse in four weeks. “They take such good care of you. It’s like doing business in a small-town bank. They give you their cell numbers. They say now if you have a problem, you call us. Try this with one of those big-city hospitals. It doesn’t happen,” he said. Brannies’ surgeon, Dr. Chuck Romanick, has helped steer Hill Country Memorial’s hip and knee replacement program to more than 400 surgeries a year. Now the hospital markets its nationally recognized program well beyond the Texas Hill Country. Jayne Pope became chief executive officer of Hill Country Memorial in 2013, and she attributes much of the hospital’s success to its fervent and never-ending focus on improving patient care. In this community, if you do a bad job, everybody knows about it. 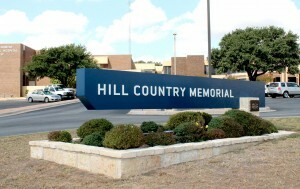 But not every rural hospital can replicate Hill Country Memorial’s success. Len Nichols, a health economist at George Mason University in Fairfax, Virginia, says many small towns simply can’t sustain an acute care hospital. Instead, the dozens of rural hospitals that have closed — and hundreds more at risk — should consider converting to urgent care centers and partnering with larger regional hospitals, Nichols said, to allow rural residents to be stabilized and moved quickly to hospitals where doctors often have more expertise. This story was reported in collaboration with PBS Newshour producer Jason Kane. This entry was posted in Current Events, Health/Medicine. Bookmark the permalink.